The Nissan LEAF is in the record books.. again. This time beating a record held by Chrysler for the largest parade of electric vehicles. While the Nissan LEAF electric car may not be popular with some drivers in Arizona, it has become one of the most prolific of EVs for the Guinness Book of World Records. In this latest record setting, the LEAF beat out a record set by Chrysler for the largest parade of electric vehicles ever assembled. The previous set was for 218 vehicles. 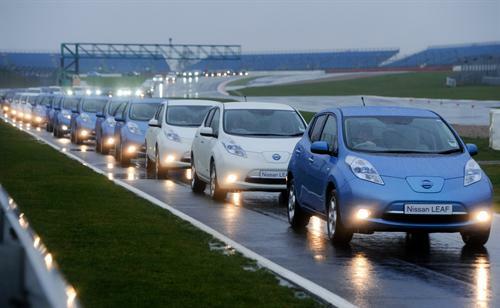 Nissan managed to assemble 225 LEAF electrics at the Silverstone race circuit in the United Kingdom. Nissan LEAF owners from around the Kingdom converged on the raceway on Saturday, November 24 to drive the Formule One circuit in their LEAFs. A total of 225 cars were on the track at one time, setting a preliminary record. That record was ratified two days ago by Guinness judges to officially become the current Guinness World Record for the largest parade of electric vehicles. Some celebrities, including Robert Llewellyn and Dallas Campbell from British television were on hand along with the Guinness adjudicators. Paul Willcox, Senior Vice President for Nissan Europe commented: "It was great to see so many LEAFs on the track at the same time and to hear how far some of our owners travelled to take part. We are delighted to have broken the Guinness world record and to have our customers at the heart of that success." The LEAF is not, of course, new to the record books. Earlier this year, it set the record for the fastest car driving in reverse for over a mile at the Goodwood Festival of Speed when driven by Terry Grant. In 2011, it also set a record on the Pike's Peak Hill Climb.